What are the weights of large and extra large chicken eggs? Do I need a rooster for my hens to lay? No. Your hens will lay eggs without a rooster. In fact, most eggs produced commercially come from farms where there are no roosters. Hens are like women. They produce eggs on a regular basis without the assistance of a male. The male is only needed if you want to have your eggs fertilized. Other than that the male is not needed, same goes for chickens. Just ask my wife. Can I eat fertilie eggs? Yes. 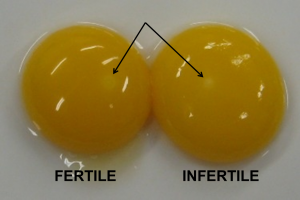 You can definitely eat fertile eggs. 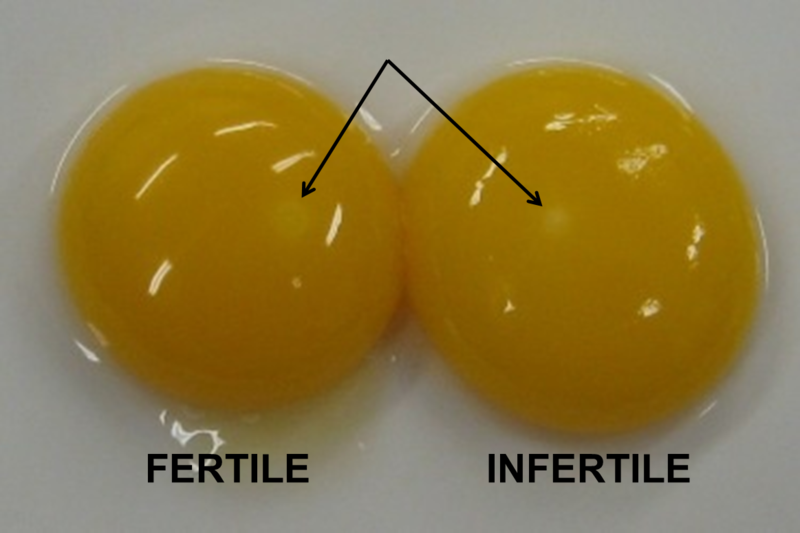 Fertile and infertile eggs look very similar and you won't be able to tell the difference without looking closely at them. They also taste the same and contain the same nutrients. See photo below. There is not much of a difference is there? What are the brown or red spots in my eggs? The red or brown specks that you sometimes find in farm eggs are called "blood spots" or "meat spots". These tiny spots are not harmful and are caused by the rupture of a blood vessel during formation of the egg. While some people my find them unappetizing, they will not affect the taste of the egg. Commercial eggs found in the grocery store are candled to check for defects in the eggs. Typically, eggs with spots are not found in the supermarket; however, they are used in other commercial foods. Contrary to popular belief, a blood spot in an egg does not mean that it has been fertilized. Should eggs be stored blunt or pointy side up? There is an air pocket in the blunt end of the egg. If you store the egg blunt end down, that air pocket has a tendency to rise — not completely through the egg, but enough to reach the yolk. By storing eggs blunt end up, the pocket of air stays away from the yolk, and the egg stays fresh longer.